It's really no secret at this point that I have loved working with the Electric Quilt Company EQ7 program over the past 3 (almost 4) years. It's even less of a secret that I love working in EQ8 even more. 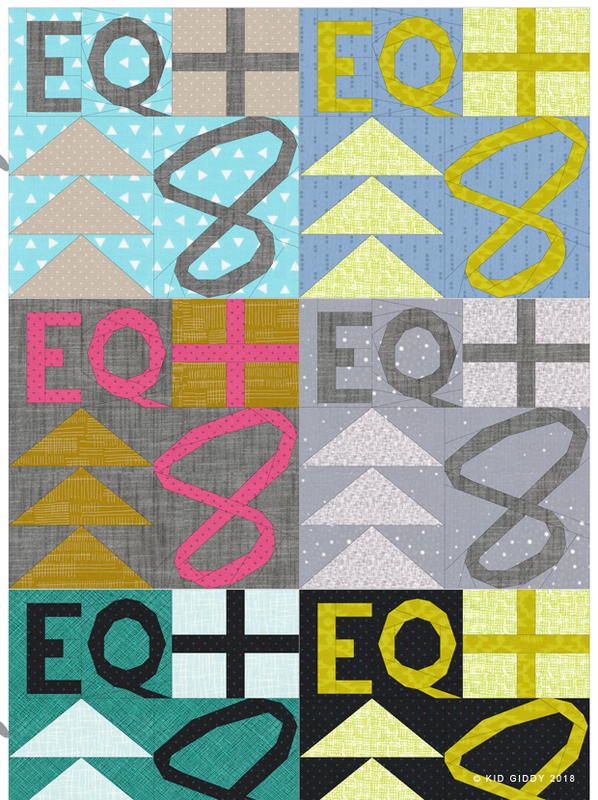 Therefore I'm so thrilled and honored to share with you that the Electric Quilt Company has selected me as one (of their two) EQ Brand Ambassadors this year along side AnneMarie Chany (of GenX Quilters). 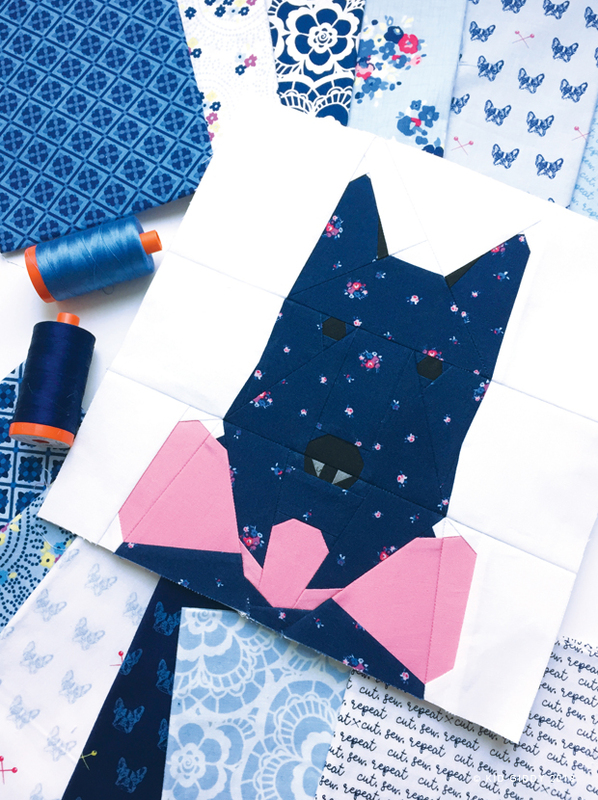 Last year I created four foundation paper piecing dog blocks as part of my new #DogBlockSeries. I have always loved dogs but haven't been able to have one of my own since childhood. So I have decided to live vicariously through all of my friends and family and my love of sewing. It all started with the French Bull Dog as a collaboration between Christopher Thompson, his gorgeous frenchie Edie and myself for his gorgeous Blue Carolina line. She was a smashing hit, but she was lonely and so I created the Pug Dog. With those four puppies done...and more to come...I started thinking of how I wanted my quilt to look. I brought them all together in EQ8 (some I designed earlier in EQ7 - so I simply brought them into my new EQ8 file) to map out some quilt ideas. I didn't want to do a standard 12 up quilt. That could take forever since I don't have all 12 designed yet. 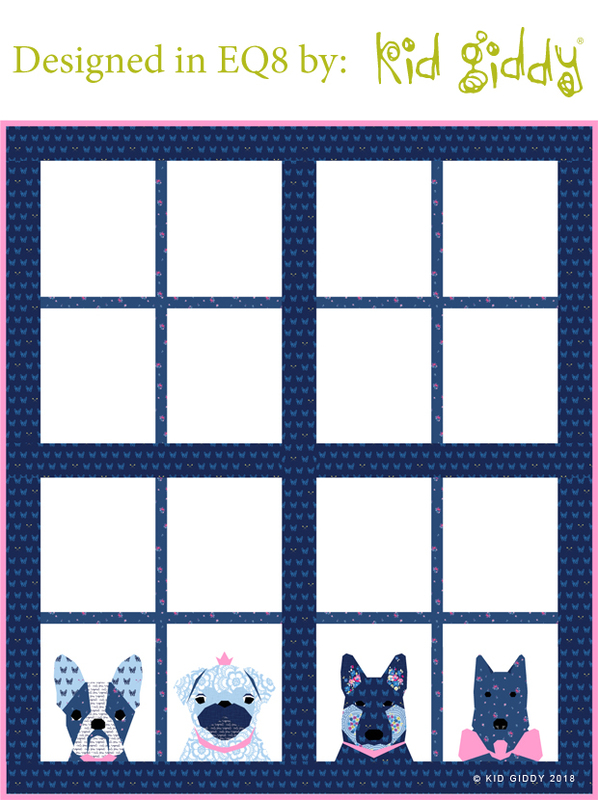 Instead I went with a truly whimsical quilt design (using the custom layout option in EQ8) that makes you want to sing out..."How much is that puppy in the window"! Right? What do you think? 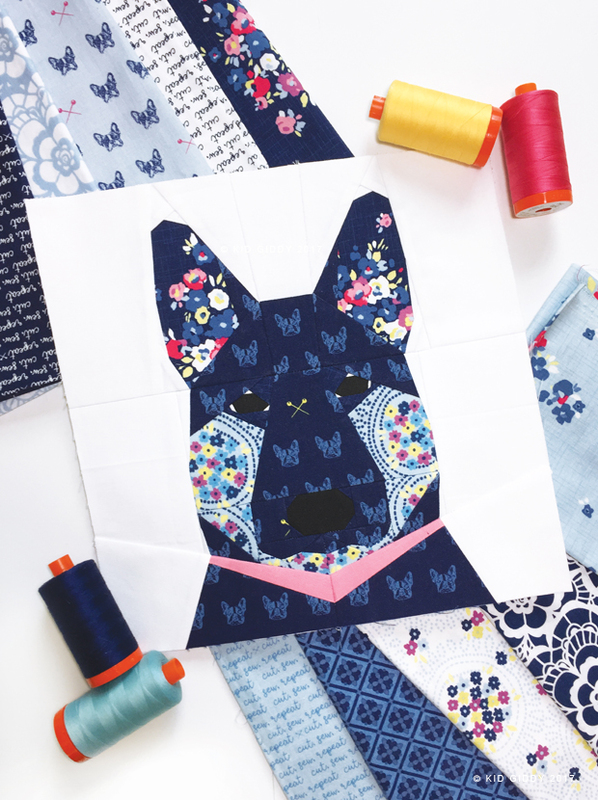 I cut up my first French Bull Dog block to make it into a cute silhouette shaped mug rug (for Christopher's awesome #theunconventionalminiquilt challenge), so I need to make another one first, but I'm excited to make this fun #DoggyInTheWindowQuilt, who's with me? I'll be sharing the details of this quilt in my newsletter next week...so be sure to sign up below! In the meantime, I have a couple of awesome things about EQ8 to share with you. One of my favorite updates was the coloring. When I colored my blocks, and found a little line I needed to delete or decided to change, I would click back over to the coloring tab and then had to recolor everything all over again. It was as if the wind blew all of my color to the left. Sure it was time consuming but I just thought, it was all still faster than anything I could've done on my own. Now in EQ8, the program understands when you color something, and make a small change, it leaves most of the color there. 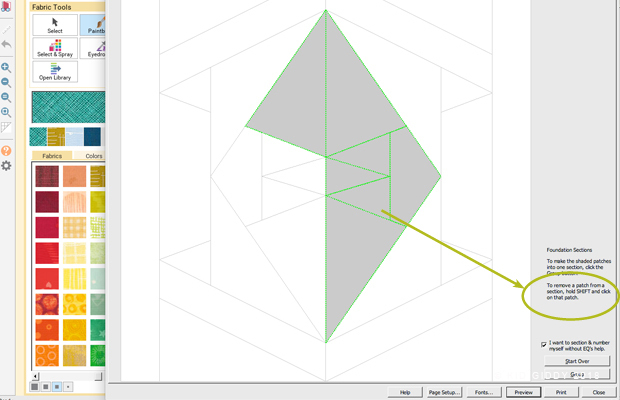 If you have a block of 4 different color squares, and delete one line (so now you have 2 squares and a rectangle) it picks just one color to be from those two squares. It may not be the color you want, but it leaves the other two squares alone. So it's less recoloring, and that saves so much time! 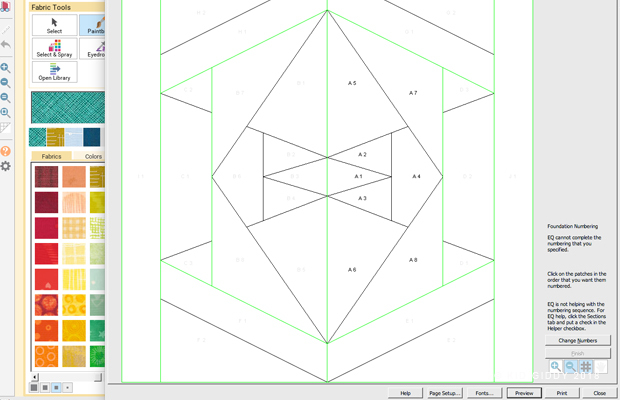 The first one says "To make the shaded patches into one section, click the group button. But what if you click an extra patch? I used to have to click the "Start Over" button. Every time either in the very beginning or the very end. But now, see that new second message? 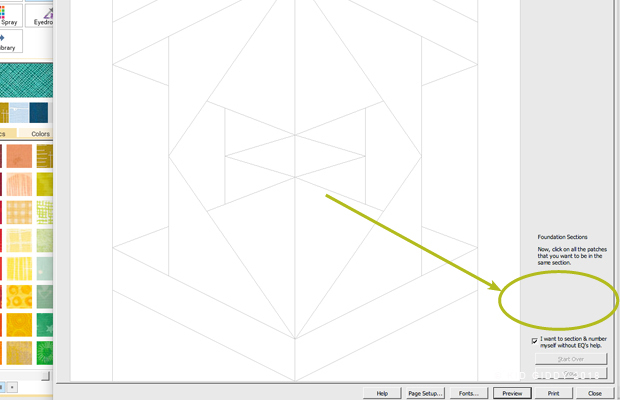 "To remove a patch from a section, hold SHIFT and click on that patch."!!! Do you know what that means??? It's like an UNDO button without being an UNDO button!!!! And it's not just one undo - you can click undo a lot of times. All the way back to the beginning if you'd like. It's like this new little update that slipped under my radar this whole time, and now has me realizing how much time I will save when I have all these itty bitty tiny pieces and accidentally click the wrong one. What to know what else this means? It means that you can also hold the SHIFT key and click on the patches too when you are in the numbering tab. It doesn't say that here on the right side...but you still can. I tried it and it worked! So maybe you want to change a sequence or you accidentally clicked in a different section and that numbered it B1, when it really has to be B5 - you can undo it! These are just a few more reasons I love the new EQ8 program and over the course of the year, I'll be sharing some tips and tricks for working in EQ8 and hope you'll come by and check them out. I also have some new patterns coming out soon and a new 12 week sew along planned for Christmas. It's a quilt I've been trying to put together for the past few years! If you are new to the Electric Quilt company, or just new to hearing about EQ8, visit their website for even more info and tons of helpful tutorials and videos. Use the code "EQ8Kerry" to save 20% off of all your purchases (this whole year!!!)! Don't forget to sign up for my newsletter. Next week I'll be sharing the Doggy in the Window Quilt measurements as I mentioned below and the pattern for this #GeoHourglass block I created for this tutorial.